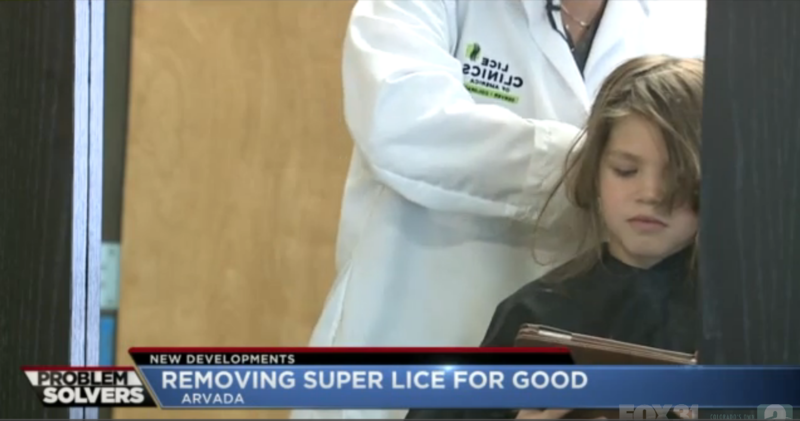 WESTMINSTER, Colo. — A little girl from Arvada is finally lice free after four months thanks to the FOX31 Denver Problem Solvers and a local business with a new way to get rid of the bugs. Latasha Fernandez reached out to the Problem Solvers last week because her 7-year-old daughter Karma has had head lice since December. She said she tried all of the over-the-counter remedies, at-home treatments and took her daughter to her pediatrician. She thought new bugs kept coming home with her from school, but it turns out that might not be the case. 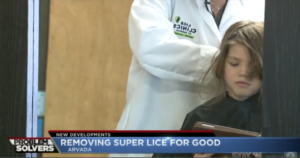 Karma had “super lice.” The bugs are the same as regular lice, but have developed an immunity to over-the-counter lice treatments like Rid and Nix. Experts said those treatments only work between 20 percent and 40 percent of the time. Super lice has been found in 48 states. “I think a lot of the time parents feel like they keep getting it, but what it really is, is they never quite got rid of it,” said Kelli Boswell, owner and operator of Lice Clinics of America in Arvada. The Problem Solvers brought mother and daughter to Lice Clinics of America on Sunday for a lice check. Fernandez said she hadn’t seen live lice or eggs in her daughter’s hair since Wednesday. Only 20 percent of people who test positive for lice say their head feels itchy. Upon inspection, Boswell said that to the naked eye, she initially thought Karma was lice free. Boswell then sprayed an oil on Karma’s hair to loosen any potential eggs and went through her hair using a special fine-tooth knit comb. She found about 20 eggs. Her mom had about 20 eggs too. “I know what I’m looking for and I didn’t see anything,” Boswell said. She said because the eggs are so small, it is extremely easy for parents to miss them in their child’s hair. “When you’re combing out you don’t have them all and then two weeks later, pow,” she told Fernandez. Lice Clinics of America uses a new approach to killing super lice by heat blasting the bugs instead of using chemicals. The special dryers blow 136-degree air onto the hair at about three times the strength of a hair dryer. It takes about 30 minutes. “What we’re doing is dehydrating the head. It dehydrates the lice, but most importantly the eggs,” Boswell said. After dehydrating the hair, the clinic combs out the dead lice eggs and applies an oil treatment to the hair for extra protection. Lice Clinics of America guarantees patients will be lice free when the treatment is finished. “I’m so happy that I finally came forward and asked for a little bit more help because I didn’t know about this place at all,” Fernandez said. Lice Clinics of America has only been open in the Denver metro area since September. The company plans to open three more locations in the future. A Colorado Springs location and either Stapleton or Centennial will be open by the end of 2016. At $175 per person, the hot air treatments are much more expensive than lice shampoo from the drug store. Some insurance providers cover the cost. Fernandez said the expense is worth is worth it for peace of mind. “It’s worth it to do it and get it done the first time right instead of dealing with it for four months,” she said. It is not necessary to wash items; they only need to be placed in the dryer for 30 to 40 minutes on high heat. Include special stuffed animals, blankets or other cloth items that are slept with, bed linens, pillows, comforters, blankets pillow shams, backpacks, jackets, scarves and any clothes worn or towels used in the last 48 hours. Vacuum common areas like carpets, rugs, cloth sofas, chairs, cloth car seats, safety seats and any large pillows that can’t go in the dryer. Lice have claws, not sticky feet and don’t get around very easily. They crawl quickly, but cannot travel long distances. Do not boil anything. Place anything in the dishwasher or clean with hot soapy water. It will not kill lice. Instead, place items in the freezer in a baggie and keep it there for two days. Include hair brushes, hair ties, scrunchies, helmets and hats. There is no need to have your home deep cleaned by a cleaning service or yourself. Lice cannot survive very long off a human host. Anything that cannot withstand the hot dryer cycle, the freezer or be vacuumed needs to be bagged for three days. Pets cannot carry lice.